Tournament Directors: Dean Norman and Michael Rocks. This tournament was originally intended as an Anzac Day event, but a decision was made to change to the following Saturday due to the commemorative nature of Anzac Day. The weather on Saturday, although cold, was thankfully, much better than on Tuesday. In a slight change from the usual format for single day tournaments, a series of knockouts were run after the conclusion of pool play. This kept all teams interested until, at least, the penultimate game. The WPA seeding list was used to rank the top teams and it was nice to see that many of the unseeded teams have so little respect for past performance. The biggest single upset was probably George Brown and Tommy Werry thumping top seed Phil Doyle and John Moss 13-2 in the first round. Phil and John recovered from the shock to reach the final against Barbara Johnston and Graeme Morris. After two ends it was 1-1 and then Phil and John scored 12 unanswered points over the next five ends to record a rather one-sided result. Khandallah results were very good. Peter and Tony played to their seeding and it is only a matter of time before they pick up some silverware. Susan and Elizabeth had an excellent tournament - beating the Dykes for the first time and winning their pool. 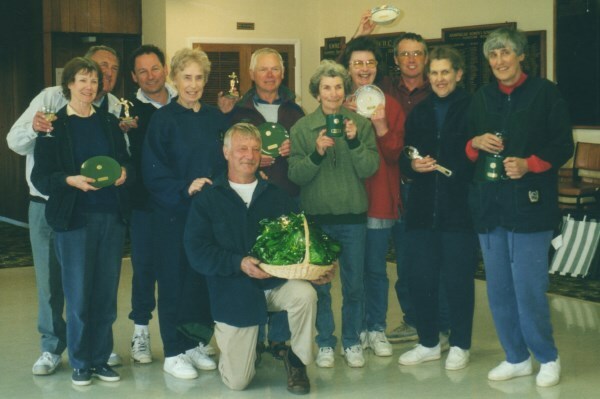 In the plate, Khandallah was the winner on the day as Derek and Sandra edged out Pam and Ron in the final (13-9). This event has whetted Derek's appetite for competitive play and he is now looking for a partner for the Winter League. Brenda and Neil had an erratic start to the day, but settled down later on to take out the Bowl final (13-5 over Gerald and Margaret). In the Mug section Dorothy and Marj, in their first tournament together, overcame their slow start to win the top prize in convincing style (13-2 over Rosina and Vera). Daphnie and Janet finally put a horror day behind them to beat Rex and Shirley 13-9 to win the Spoon final. Thanks to all the teams for making it an enjoyable event, particularly the Hataitai club who mixed and matched some of their players to encourage new players to take part in the tournament. Special thanks to Elizabeth Rocks and Susan Norman who donated the excellent raffle basket (won by Peter Dennett) and Karen Millar for running the sausage sizzle. Club: HT = Hataitai, KA = Kapiti, KH = Khandallah, MA = Masterton, PA = Park Avenue, SI = Silverstream, WE = Wellington. Division: T = Trophy, P = Plate, B = Bowl, M = Mug, S = Spoon. * = default. Results indicate W/L against numbered opponent.